mmerse yourself in traditional Mi’kmaq culture as you learn the fine art of basket making in Elsipogtog First Nation, New Brunswick. 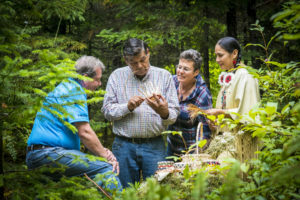 After a traditional smudging ceremony in the community teepee, guests will head into the woods for a walk along the Heritage Path where they will learn about the plants and trees used for basket making and other time honoured purposes. 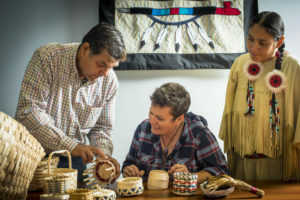 After the Heritage Path walk you will be served a homemade and traditional Mi’kmaq snack and beverage before learning and being introduced to the materials and processes you will use to make a nest basket under the guidance of the elders. As you work on your basket, you will learn some traditional Mi’kmaq ways and phrases. By the end of the day, you will leave enriched by the teachings of the elders, carrying a basket that you yourself have woven. Tour Time: 11:45 a.m. – 5:45 p.m. This “Mi’kmaq Basket Making & Heritage Path” experience is based out of Moncton, New Brunswick. Our vehicle is a comfortable, air-conditioned Mercedes-Benz Sprinter which holds a maximum of 11 passengers. This tour will operate every Tuesday and Thursday from May 17 to October 31, 2018. Due to safety regulations, children five and under are not permitted on tour.